Home / UncategorizedLight up your Wardrobe with these ideas!! 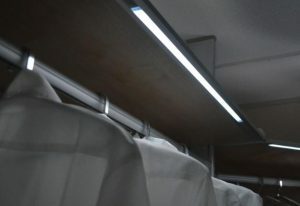 Wardrobe lighting is an often ignored part of wardrobe design but it can be a pretty useful one. Charm up all the sections of your wardrobe with light fittings inside it. Get a better visibility, stunning looks and a complete designing by installing the types of wardrobe light fittings according to each section and variations. Here we are providing some ideas on how to light up your wardrobe. You can try to illuminate your closet interiors by using strip lights underneath the hanging rods or under-roof sections of the wardrobe. Further enhance the features by using sensors for automatically switching on the strip lights. Proper lighting helps to create the perfect ambiance in your bedroom by providing illumination with a balanced distribution of lights. 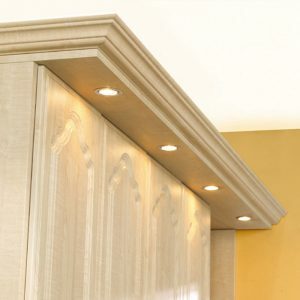 Cove lighting is an excellent choice for internal cabinet lighting. 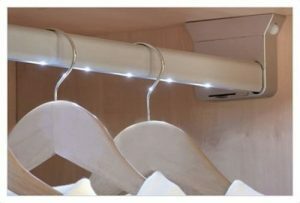 See clothes in their true colors by using these on an illuminated clothes rail. 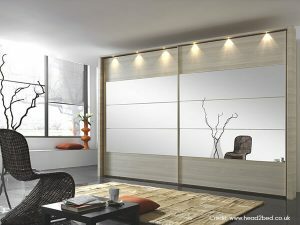 Wardrobe can have drawer lights installed which light up as soon as you pull them out. Drawer lights use infrared sensor technology and are an efficient convenience solution when added to your wardrobe design. Use of energy efficient LEDS mean they also last a really long time. You may light up the outer sections of the wardrobe as well by installing few lights over the wardrobe by creating a false platform. Wardrobe lighting gives a complete look to the wardrobe inside as well as outside sections. Depending on your budget, choose different types of lighting accessories to increase the functionality of your wardrobe design. ← Faux leather: Chic In Interior Design! !